Apologies for the slightly later than normal publication, it's been another busy week and hence the reason I'm writing this at gone 2am. The main things keeping me busy this week have been - the battle to beat injury so that I can run the Harrow Half Marathon on Sunday (attempting to do this through rest and trips to the physio), my daughter's first day at primary school, an important Non-League Day (NLD) planning meeting with Prostate Cancer UK (PCUK) which included a bit of filming, my first trip of the season to see QPR, some more general family engagements and a few days at work. It's the NLD planning and promotion that's taking up the most time though. 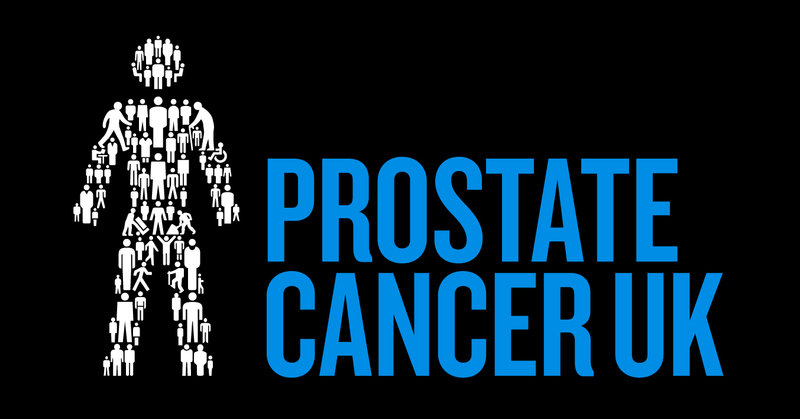 At the moment, my biggest priority is to try and get as many clubs and fans to pledge to do something to raise funds for PCUK on the day. 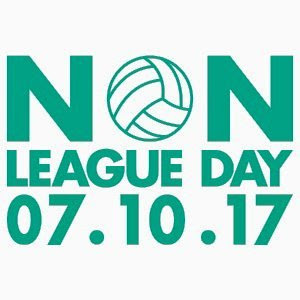 From a club point of view, I want to get as many as possible signed up to hold an event at their game on 7 October. It could be a simple bucket collection, a raffle or something far grander. For individual fans, the charity and I are trying to encourage people to walk, run or ride to whichever game they're going to. Apparently one team in the National League is getting a group of fans to walk around 20 miles to an away game which should be very doable and hopefully a lot of fun. I've done a number of cross London walks with QPR fans over the last few years and you get to meet some great people in the process. 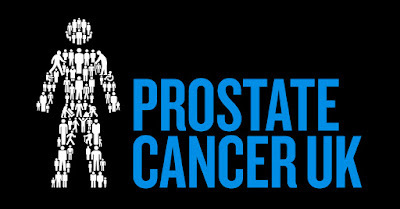 If you fancy doing something like this get in touch with the charity or simply text BADGE to 70004 to donate £5 and you'll get one of their iconic 'Man of Men' badges sent to you. We've also launched our new range of NLD t-shirts to go with some of the most popular ones from previous years. If you're a groundhopper then I hope you'll like the theme. With these, the manufacturer will also be donating a percentage of the proceeds to PCUK and grassroots football charity Street League. All the designs can be found towards the bottom of our homepage and several of them can be customised to your club's colours. 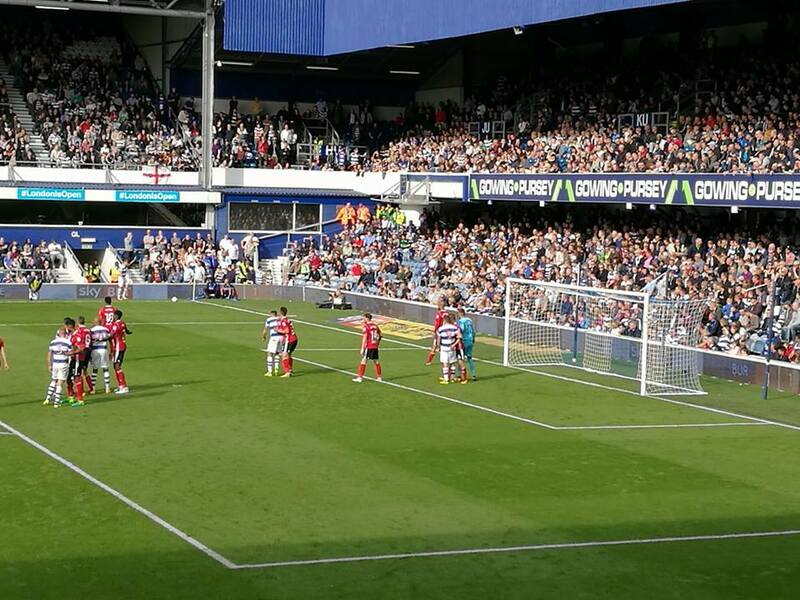 As mentioned above, I went to Loftus Road again this weekend to watch my first QPR match of the season. High flying Ipswich were the visitors and they were, thankfully, very disappointing. Rangers came out on top in all the possession, shots and corners stats and duly won the match with goals from Jamie Mackie and Luke Freeman. The 2-1 scoreline was flattering to the Tractor Boys whose goal came from what seemed like their first shot in the 89th minute and they could and probably should of stolen a point in injury time when a glorious chance was sent over the bar by Tom Adeyemi from close range. 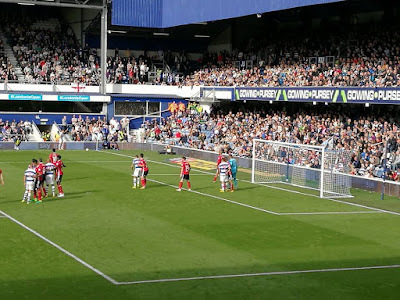 Aside from the somewhat frantic finish, most QPR fans left the ground in buoyant mood after seeing a spirited performance from a side who weren't expected to be doing as well as they are. Also I'd like to give another nod to the Twickets re-sale website. I used them again to get my ticket for this and saved £££s. The season-ticket holder's seat I ended up with was pretty decent and would have cost me £38 if I'd bought it on the day but by using Twickets I paid £26 online including fees and then picked it up in person from QPR's ticket office. To stress, it's all legitimate and fully endorsed by the club with tickets never being sold for more than face value. Give it a go. There are over 100 matches in the London area over the next seven days as the Premier League and EFL take centre stage. The Champions League and Europa League get underway and there are also some FA Vase replays and the next round of the FA Cup too. This football guide is so appropriate. I wanted to teach football to my brother. Now i think i am going to follow these steps to teach him. Thanks for sharing.